Everyone needs a few extra angels around to keep them protected at all time. Our new Solar Angels with LEDs arrive in a pair of two and will keep you feeling blessed each time you see them in your yard day and night. 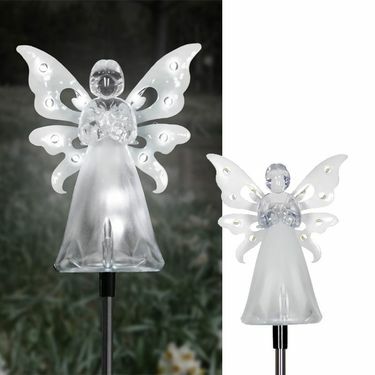 These clear white angels will look stunning in your yard or garden during the day, and thanks to a discreet solar panel, 12 LEDs will light up her wings each night with the soft, warm glow of the holiday spirit. Though our angel yard stakes are particularly popular during the holidays, you can leave them up all year to enjoy their glorious illumination. They look especially lovely when lining a driveway or walkway. Each solar stake stands 24 inches tall and comes complete with an option 10 inch extension rod to make it 34" tall if you prefer. Our durable angel solar light stakes are made from metal and acrylic. Size: 4" x 2.5" Angels, Stands 34" tall. Acrylic, Metal, Solar.